The future high-definition data format has not been set in stone yet. There is a format war going on between the Blu-ray format and the HD DVD format for which will become the true successor to DVD. Currently, the two formats co-exist with each having their own pros and cons but overall having two HD formats just confuses consumers. Take for example flash memory cards. Some cameras take Compact Flash, some SD, some xD, others Memory Stick and so on. 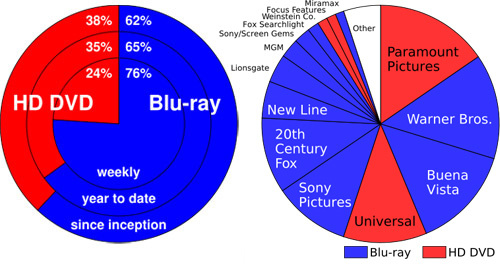 Both HD DVD and Blu-ray discs store much more data than DVD discs through the use of a 405nm blue-violet laser. Traditional DVD discs store data in a circular track that is read by a wider and less precise 650nm red laser. By using a blue laser, data can be scrunched together closer in a narrower track and thus a Blu-ray or HD DVD disc can hold more. More room for data means higher quality video and better audio. A DVD can hold a total of 4.7GB per layer while an HD DVD can store up to 15GB per layer with Blu-ray leading at 25GB per layer. Most discs can come in a dual-layer format, leaving HD DVD with 30GB per disc and Blu-ray with 50GB. Blu-ray stores more data as you can see, although recent updates in HD DVD technology can fit three layers of 17GB each onto a single disc. The same goes for Blu-ray with TDK having developed a way to fit 200GB of data (6 layers x 33.3GB per layer) on a single disc. Regardless, the current consumer-ready state of technology puts HD DVD storage at 30GB/disc and Blu-ray at 50GB/disc. Why hasn't Blu-ray taken over long ago if it holds so much more data than the HD DVD format? There are lots of issues to consider with this but it all boils down to a) how many companies and film studios support each format and b) the cost of each format and related hardware. Blu-ray media holds more data but it costs more and Blu-ray players currently cost more than HD DVD players as well. Consumers will prefer the cheaper alternative and that is currently HD DVD. However, if you bundle a Blu-ray player with something a consumer is going to buy anyways, such as a Sony PlayStation 3, the extra cost is mitigated. Compare this to the Xbox 360 where users must buy an extra HD DVD peripheral to play such movies. The PS3 gave Blu-ray a big head start. Also, Blockbuster has begun offering Blu-ray movie rentals and will not rent HD DVD movies. As a person who rents movies almost weekly, that alone is a large draw towards Blu-ray for me. Charts from Wikipedia. The left one shows US sales as of Dec. 7th, 2007. Right one updated Jan 5th, 2008. Both HD DVD and Blu-ray supporters are offering gratuitous deals for those buying their hardware. Look out for 5+ free Blu-ray/HD DVD discs rebates when purchasing such hardware. For early adopters that don't want to get stranded with a dead format in the future, Samsung will be releasing a dual-format HD DVD and Blu-ray player in about two weeks. As you might imagine, the player is quite expensive at ~800 USD. c) Blu-ray holds more data and is in my opinion more future-proof than HD DVD. Planet Earth is a must have series for whichever HD format you choose. Do you plan on upgrading to HD DVD or Blu-ray anytime soon, given that you already own a HDTV to support it? Back at my school apartment I still have a dinky CRT TV so Blu-ray isn't in my future anytime soon, although I wouldn't mind a Blu-ray drive upgrade for my MacBook Pro to play movies on a larger external display. For those wondering if there is even a big difference between regular DVD and Blu-ray/HD DVD - there is and it's huge. If you already own an HDTV and play regular DVDs you are absolutely missing out. Playing Planet Earth Blu-ray in 1080i is quite a sight to see. Every detail is clearly visible: individual leaves on trees, each feather on a bird, each scale on a fish, et cetera. The words crisp and scintillating come to mind. Thanks to the anonymous Skribit user who suggested I write about this topic. Update: Warner Brothers studios elected to go with Blu-ray technology exclusively and will abandon HD DVD mid-2008. This almost certainly ends the Blu-ray vs HD DVD battle, with Blu-ray being victorious.